The first Permanent Library, at a property owned by Mr. R. R. Bellamy in Bridge street, was opened in 1838. It was supported by a number of shareholders and just over 70 subscribers, and contained around 2,000 volumes. The shares were £10 each together with an annual subscription of 16 shillings. Subscribers who were not shareholders were allowed to join for a Guinea (21 shillings) a year subscription making it a fairly exclusive club. The Burton Literary Society, High street, commenced in 1844 and had a reading room and a library of about 1,100 volumes mostly, but not exclusively, of a scientific nature. It was supported by a subscription of £1 per annum for first class, 8s 8d for second class, and 5 shillings per annum for third class. First class had the privilege of attending the reading room at all hours of the day, second class in the evenings only from 5:00 to 10:00pm, third class only had restricted access. The reading room also had London and provincial newspapers available together with most of the popular periodicals of the day. The Secretary and Librarian was Mr S. Simnett. The Young Men’s Christian Association (YMCA) in Guild street, established around 1846, introduced a reading room, and library containing about 1,400 volumes. Mr. John W. Lomas was Secretary. In 1867 the (Church of England) Young Men’s Christian Association was transformed into the Mechanics’ Institute. By 1868 it had a reading room and a library of 4,000 books, and by 1871 it had been moved to premises in Station Street. In 1876, the Mechanics’ Institute and the Burton Literary Society were amalgamated as the Burton Institute. This moved to new premises in Union Street in 1879. A very tall in its day, narrow building of four bays designed in Italian Gothic style, by Reginald Churchill of Burton as seen above. The institute occupied the ground floor with a library of now nearly 8,000 volumes and a reading room; the second floor was occupied by the School of Art and part of the third floor by the School of Science. The institute grew from 650 members in 1888 to 966 in 1896, when it was dissolved and its premises were acquired by Burton Municipal Corporation for use as Burton’s first Free Library, available to everyone. By this time, the collection had grown to 19,000 volumes together with an additional reference only section of 1,700 books. Part of the building and 3,000 books, largely technical, was reserved as a subscription library. This had three levels of membership; first class at 21 shillings, second class at 10s 6d and third class at 5 shillings for an annual subscription, the different classes of subscription again being used to determine what hours of access were permitted. In 1902, the Borough Librarian had salary of £120 plus an additional £45 for his additional duty of Secretary for both the Schools of Art and Design. If that wasn’t enough, he was also absent for some hours to fulfil his other duty as Museum Curator just up the road on the corner of Guild Street. At this time, the library was investing something like £50 a year on new books. 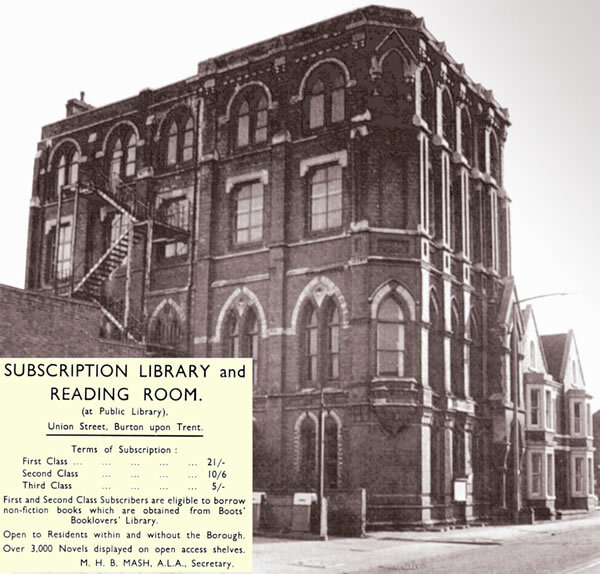 Aside from the main Union Street library, due to lack of space, branch reading rooms for newspapers were established at Uxbridge Street and Victoria Road schools which were open in the evening from 6:00 – 9:30pm. Towards the end of its time, the Union Street library was hopelessly inadequate and the later librarian, Kenneth Stanesby spent most of his energy leading campaigns for a replacement library (added to his duty of ejecting schoolboys from playing in the lift which was a popular free entertainment of the time). 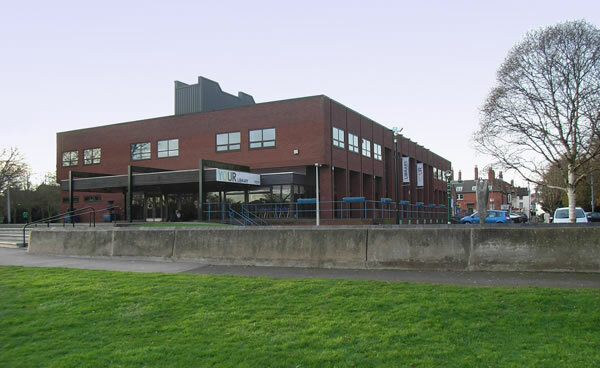 The new Burton library was finally opened in 1976 at Riverside, off High Street on the redundant Bass Maltings site. The Union Street building was unceremoniously demolished in 1977.